I can't believe it's my 3 year bloggerversary! I want to say thank you to EVERYONE who reads, comments and shares my blog. I honestly would NOT have gotten all the opportunities that I have without you all. I always try my best to give back to you all. With that..here is my bloggerversary giveaway! 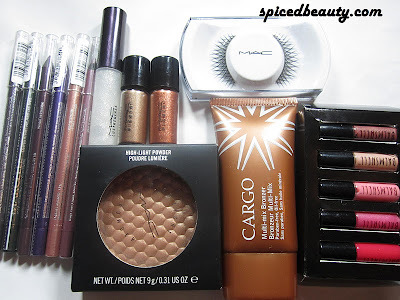 I have been accumulating products over the year to giveaway. There is a heavy Canadian and MAC influence because it's mostly all I use! 17 pieces! Yes.. 17 pieces for you to try enjoy and share if you want. I'm all about product reviews! Cant get enough of them! Congrats on 3 years, Keep up the great work! Congrats Jenn! You're blog really is awesome! I would love to see more product review, particularly regarding primers. I would love to see more product reviews. Maybe Canadian products that are WOC friendly. I always love reviews so these would be pretty much welcomed :) May there be many years more! I love seeing product reviews, especially from Canadian companies, or Etsy shops. congratulations on you anniversary.. more power to spicedbeauty!! I like finding new items so I enjoy reviews, how to's and of course love the giveaways! Thanks! im relatively new but congrats on 3 years. the last (close to) a year of following u has been awesome. I would like to see product reviews. Yay, congrats jenn!!! amazing. I would love to see more tutorials or fotds. I love all your posts, but reviews are always great because they give me an idea if a product is good or not. You know I love your blog but I would love to see more FOTD's and VIDEOS! :) Happy anniversary Jenn! hi jen!Congratulations! I wanna see more on product reviews and tutorials. I would love to see more makeup looks! Congrats on your 3 years, that is amazing! Congratulations on your three years of blogging! Did you have cake? congrats, and I love the reviews! Like Kelly, I'd like to see more videos please! thanks for the giveaway and a big congrats for making it to 3 years! thats huge! Hey, i liked your blog and giveaway, happy 3 year anniversary! I always love to see swatches and/ or reviews! Congrats on 3 years!! Love your blog, can't wait for the 4th year anniversary! Tutorials and reviews are always great. Congrats on your Bloggerversary. Wishing you many more successful years. Congrats My Love! 3 years flew by fast! I love hauls, and makeup tutorials! I'd love more fashion post and product reviews!! Congrats on your anniversary girl! I'd love to see more product reviews & makeup looks. Happy 3 years! Here's to many more blogging years! I love reviews with photos, especially swatches! i love your blog!! please do more reviews! Congrats on 3 years! I love makeup reviews they are always a favourite of mine! I love the product reviews and will often buy from those!!! Thanks for a chance. I like seeing reviews on products you DIDN'T like so I know what to avoid. I find those the most useful. Congrats on your 3 years! I would love to see more make up reviews. Reviews and make up looks. Congrats on 3 yrs. Beautiful blog...congratulations on 3 years! I would love to see swatches and makeup reviews. wow! congratulations on the 3rd anniversary!! I love seeing more giveaways! I would love to see NOTDs, swatches, nail art. Congrats on 3 years! That's amazing!! I would love to see posts on makeup tutorials!! I'm all about product reviews. The more the merrier. I love product reviews - especially products that are not over-priced and easily accessible. Thank you for the great blog! I would love to see more nails posts! Thanks girl, you're so cool! I love reviews of new products--all new products, including hair, nail, and makeup...oh, and skincare! Love it all!! Happy Blogoversary and thanks for the giveaway. I like posts on beauty tips and tricks, whether it's makeup, skincare or fashion, I love reading these. I would like too see more post about tutorials,sneak peeks of neW LAUNCHED products and monthly favorites! Here at the last minute! Congrats on three years of blogging! I really think you give us a pretty well-rounded variety of posts already. The only thing I can think of is more drugstore reviews; a lot of the lower-end brands are starting to put out much better and more innovative products, so that could be interesting. Thank you for this awesome giveaway! Congrats on the 3 years, that's impressive :) I am a fresh new follower, looking forward to getting to know your blog! I would like to see more skincare reviews. wow 3years!!! congrats!! Keep it up!!! I would like to see reviews of products. I would like to see more makeup tutorials - I'm not so great at putting on makeup sometimes! I'd like to see more top ten post. Makeup reviews (especially on mascaras and lesser known quality brands) and makeup tutorials! I would like to see tutorials!! I would love to see a post on your favourite drugstore products! I would like to see more bargain finds! i like to see reviews mostly of mac products!